Dubai/Sana’a: A video by Yemen’s Al Houthi militants showed the slain body of the country’s former leader Ali Abdullah Saleh. 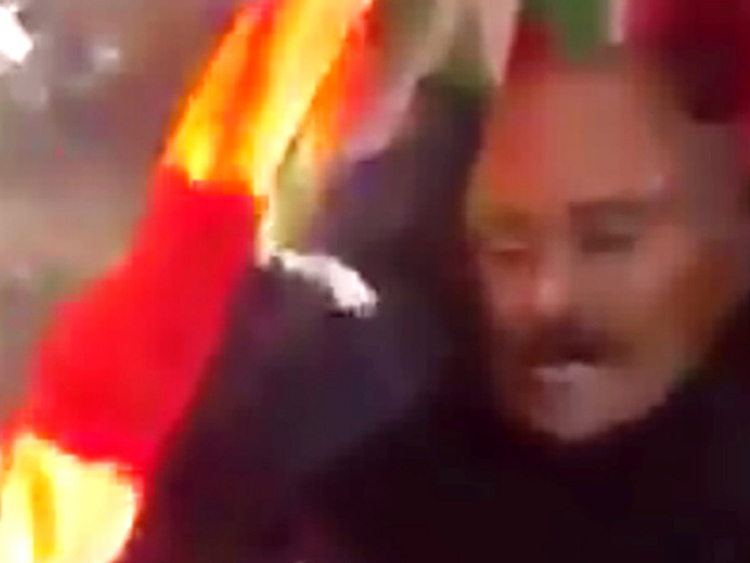 Officials from various sides, including Saleh’s party, have confirmed that the video shows the former powerful president, and that Saleh was assassinated by Al Houthis. The video, apparently shot by one of the attackers, showed an Al Houthi crowd picking up Saleh’s dead body, wrapped in a blanket, off the ground and lifting it onto a pickup truck. Saleh’s eyes appear wide open, the back of his head badly injured, and his shirt blood stained under a dark suit. The footage show the crowd shouting “Praise God!” and “Hey Ali Affash!”, another last name for Saleh. A senior Yemeni government official and some of Saleh’s associates, such as Nabil Al Soufi and Ali Al Bukhiti, confirmed his death on social media and TV interviews. Al Houthis, Azani said, “had prepared for this for a long time, and were waiting for the right moment to carry it out”. Saleh ruled Yemen for more than three decades until he was forced to resign following an Arab Spring uprising in 2011. He remained in the country, however, and continued to wield power from behind the scenes. In 2014, his forces allied with Al Houthi militia, despite the fact that as president he had gone to war with them on more than one occasion. The alliance between Al Houthis and Saleh splintered last week, setting off heavy clashes between Al Houthis and Saleh’s forces. 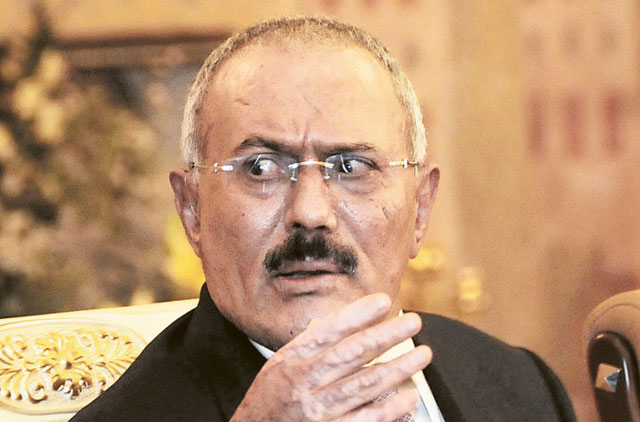 On Saturday, Saleh reached out to the Saudi-led coalition battling Al Houthis, offering to “turn the page”. Al Houthi militants accused him of staging a “coup against our alliance”. Moutaz Salameh, researcher at Cairo-based Al Ahram Strategic Studies Centre, told Gulf News Saleh’s killing will definitely have a major implications on the developments in Yemen. “It also shows there are major differences within the General People’s Congress,” which Saleh led. Salameh said he expected Saleh killing to lead to a split in the GPC, with one aligned with the Saudi-led Arab coalition, and the second with Al Houthis. Gulf News unsuccessfully tried to contact Yemeni officials and analysts in Sana’a. Some lines were not working, while in other cases, people refused to talk. One male relative of a prominent opposition figure refused to talk as his father was in Al Houthi custody. Earlier on Monday, Al Houthi forces blew up Saleh’s house in Sana’a, and they came under aerial attack by Saudi-led coalition warplanes for a second day, residents said. Meanwhile, Yemen’s president has ordered his forces to retake control of Sana’a, a presidential source said Monday. The known toll from three hospitals has reached at least 125 killed and 238 wounded in the past six days, the International Committee of the Red Cross (ICRC) said Monday. President Abd Rabbo Mansour Hadi, whose government operates from the southern city of Aden, moved to take decisive action Monday. “The president has ordered Vice President Ali Mohsen Al Ahmar, who is in Marib [east of Sana’a], to activate military units and advance towards the capital,” an official in the presidency told AFP, speaking on condition of anonymity. Yemen’s internationally-recognised government said Monday it would grant amnesty to anyone who cuts ties with Al Houthi militants. “The president will soon announce a general amnesty for all those who collaborated with the Al Houthis in recent months and who have retracted that allegiance,” Prime Minister Ahmad Obaid Bin Daghr said. A wave of air raids rattled the city Monday, witnesses said, as clashes between Al Houthis and Saleh supporters spread beyond Sana’a. The strikes appeared to hit targets near Sana’a International Airport and the interior ministry, both under the control of the Iran-backed Al Houthis, according to residents and a source inside the airport. An airport source said Al Houthi bases near the location appeared to have been targeted but the airport itself had not been bombed. Residents also reported that the fighting, which erupted on Wednesday night between armed Saleh supporters and Al Houthi militants, had spread outside the capital. Jamie McGoldrick, UN humanitarian coordinator in Yemen, said in a statement that the streets of Sana’a had become “battlegrounds” and that aid workers “remain in lockdown”.